Location near Old Town worked well for us. Room was comfortable and well appointed. Location, cleanliness and room appointments. Parking area was a bit tight. Great comfort. Super breakfast. Very convenient in room computer! Comfortable, easy to airport. Great staff. Great breakfast! In room computers. Next to highway. Very loud. We will definitely stay at this motel again while in San Diego for another cruise, or just for a visit. 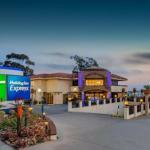 The 125-room Comfort Inn Airport at Old Town is one-half mile from the Old Town San Diego State Historic Park, known as the Birthplace of California, and provides affordable accommodation for both vacationer and the business traveler. Items included with the room rate are a hot breakfast buffet, high-speed wired and wireless Internet access available throughout the property, a shuttle to the airport, cruise ship terminal and nearby attractions, in-room coffee and parking. Area landmarks and attractions include SeaWorld marine theme park, San Diego Zoo, shopping and dining at the Seaport Village, Gaslamp Quarter and Balboa Park, the largest urban cultural park in the U.S.
All the rooms have a work desk with high-speed Internet access, 32-inch LCD television with cable movie and news channels, coffeemaker, in-room safe, iron and ironing board, hairdryer and telephone with voicemail. Some rooms have a whirlpool bathtub. Non-smoking rooms are available. This hotel has an outdoor swimming pool, hot tub and a fitness center. The 24-hour front desk has information on area events and attractions. Other amenities include a business center with a computer and copy and fax machines available for guest use, daily housekeeping, guest laundry, same-day dry cleaning service and ice and vending machines. There is a 24-hour deli on site. Restaurants nearby include Kellys Pub, Coyote Café, Casa de Reyes, the Cosmopolitan and a Dennys. Most travelers to San Diego who stayed at this Comfort Inn were delighted with their selection. The rooms were nicely decorated, well equipped and reasonably priced. The location was good, within walking distance of local restaurants and just a mile from the Old Town. The cheerful crew of employees knew all the best places to visit and had good ideas about shopping and dining. Many clients said they would recommend this property to others and planned to stay here themselves on future visits to the area.